Careers | Air-Weigh: We are dedicated to our employees. Air-Weigh offers rewarding careers in a technology-focused environment with many growth opportunities for those who are dedicated and driven to perform. We are looking for employees who will take an active role in Air-Weigh’s success and are excited to be a part of something that is making a difference. We have the unique opportunity to see a product from conception to fruition, and we take great pride in our truly ‘American Made’ products. Our engineers develop the software and hardware that make our on-board scales a recognized industry leader. Our operations group is where all of our products are assembled, tested and shipped. Our in-house sales and support teams walk our customers through selection, installation, and calibration. We do it all and we plan to keep it that way. It takes a great team to make great products. At Air-Weigh we have an extremely talented team with experts in design, engineering, training, sales, and customer support. 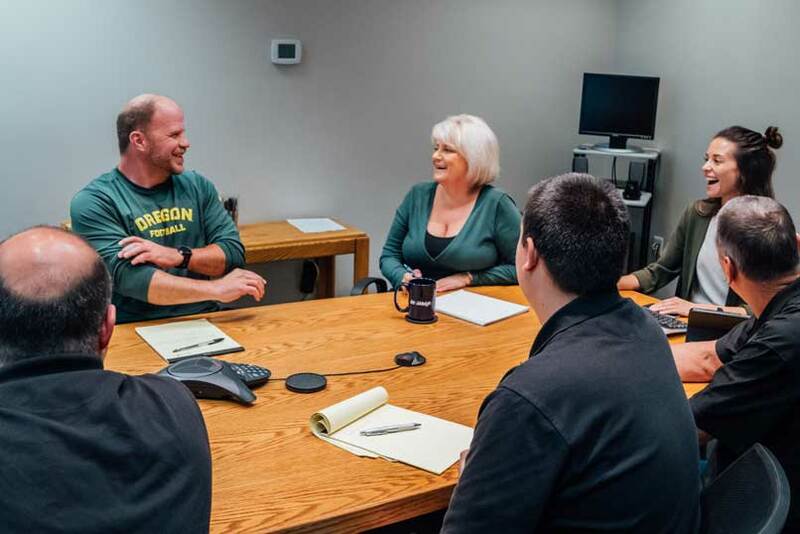 From the boardroom to the warehouse, each employee brings a single-minded dedication to caring for our customers. We are always on the lookout for great employees who share our vision. What Air-Weigh can offer you is; a great work environment with excellent benefits, and ample opportunity for growth. One hour from the coast and two hours from the mountains, Eugene Oregon is nestled in the beautiful Pacific Northwest Wonderland. Deemed “A great city for the arts and outdoors”, Eugene has a little bit of everything for everyone. Locals can often be found eating at one of the many unique restaurants, heading to the coast for a weekend away, enjoying outdoor concerts, or perusing the farmer’s market for farm-to-table fare. Life here is rich and full of flavor! Air-Weigh is home to engineers and creatives, number crunchers and builders, software developers and researchers. We welcome skillsets of many kinds and encourage growth and innovation among all. Our employees choose to work together as a team and celebrate accomplishments together. Air-Weigh encourages a work-life balance and plays an active role in helping employees grow both professionally and personally. Air-Weigh pays the majority of health, vision, and dental insurance premiums for all employees and their families, including life insurance. Our 401k program and stock options will help you meet your financial goals, and our paid time off and ten paid holidays will keep you rested and ready for innovation. We are constantly developing new technologies and growing our company through internship programs, employment, and partnership opportunities. 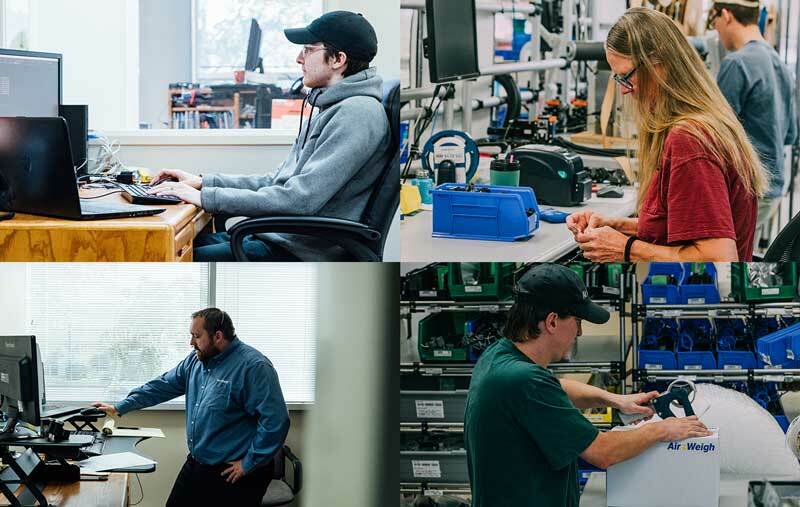 We work with MECOP to provide internships to top software, mechanical, and electrical engineering talent from across Oregon’s leading engineering colleges. Air-Weigh is proud to support higher education by providing significant and meaningful learning opportunities for developing engineers of all disciplines. The Air-Weigh internship program continues to support our business philosophy of designed, developed and manufactured in the USA!